Create delicate and pretty confections with these decorating tips made of rust resistant stainless steel. decorating tip sets come in a convenient storage box. 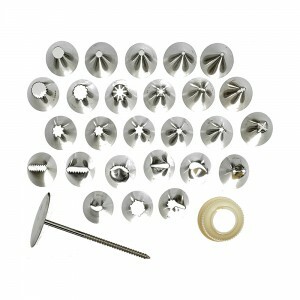 the 26 and 52 piece sets include a standard coupler and metal flower nail. Categories: BAKEWARE, deCoRatIng tIP sets, KITCHEN - PREP & COOK, SMALLWARES.